1. High performance, low cost ,small , light , portable and professional design. 2. Use USB interface to link with PC. 3. Support low voltage components up to 2.5V. User-selectable verify Vcc with one or two-pass verify voltage. 4. Support FLASH/EPROM device speedy programming function.It takes 30 seconds to process one piece of 16M bits FLASH memory. 5. 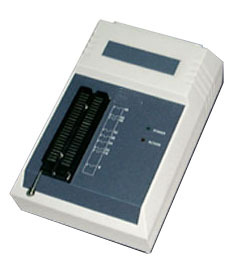 It has the simple operation software, the programming procedure had been modify into few automatic process function. 6. Universal converters for virtually all devices in one package. 7. Automatic detect the device pin insertion and contact check,powerful graph showing the situation for device. Functions: Select type, Load, Erase, Check, Program, Verify, Security. JEDEC, Binary, Intel 80/86 Hex Motorola Hex, Tektronix Hex.